On Monday, a bull gored a teen. This weekend: guess what's for supper? Yesterday, I was working on four different issues via: email, instant message, telephone, BlackBerry ... all at the same time. Ain't technocracy great! I haz a happy! Went to Firehouse Subs for lunch! I haz a sad. MacBook is in the shop. Again. A new Dell is looking more attractive. Oh, well. With the computer is in the shop, I figured I might as well go to the hockey races, or whatever it's called. 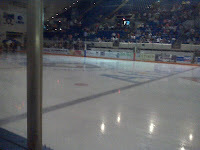 At the hockey rides, they had zamboni raffle tickets, but I ate before I went there, so I didn't get one. Got ringside seats for the hockey dance. You know who'd make a good hockey goalie? Jabba the Hut. Most of the hockey players look like they're kin to Malcolm's older brother, or Stiffler. I still don't understand why a team from Georgia and a team from Mississippi are playing hockey. Some guy named Alan asked some chick named Ashley to marry him on the message board at the hockey game. And you thought romance was dead. When I was in school, nobody played hockey. Lots played hooky, but it's not the same thing. Less beer in hockey. Not that there wasn't lots of beer sold at the hockey game. But you need to know about my school. Hotels on Jekyll Island still won't rent to anyone under 30 from my home town. That's since 1976. Instead of putting hockey players in the box as a penalty, they ought to make them wear a pink tutu. After the big fight, they showed the whole fight again on the instant replay. Where's Gordon Solie when you need him? I still don't know why Mississippi's no. 42 wanted to fight. Last time he played against Columbus, he got his throat cut. Really. When the 2nd quarter was done, I was waiting on the halftime band. They never showed. Of course, it was gonna be hard for them to keep their footing on that ice, anyway. After three, the visiting hockey team was leading, 4-2. I'm didn't stay for the 4th quarter. Braves season has officially started: Chipper's hurt. Weird... I was at a hockey game on Friday, too. Actually, the game I wnt to was Thursday night. So that shoots that out of the water. What about "Breakfast at Tiffany's?" I think I remember the film, and as I recall, I think, we both kind of liked it. Well that's, the one thing we've got.